In vivo metabolic studies in Hep-Di mice, which selectively express the Di designer receptor in hepatocytes. (A–F) In vivo metabolic tests performed using Hep-Di mice and control littermates (CTR) treated with the AAV-TBG-EGFP control virus. (A and B) CNO challenge tests. Mice that had free access to food (fed) (A) or had been fasted overnight for approximately 12 hours (fasted) (B) were injected with CNO (10 mg/kg i.p.) or vehicle, followed by monitoring of blood glucose levels. (C) IGTTS (2 g glucose/kg i.p.). (D) PTT (2 g sodium pyruvate/kg i.p.). (E) ITTS (0.75 U insulin/kg i.p.). (F) Glucagon challenge test (16 μg glucagon/kg i.p). 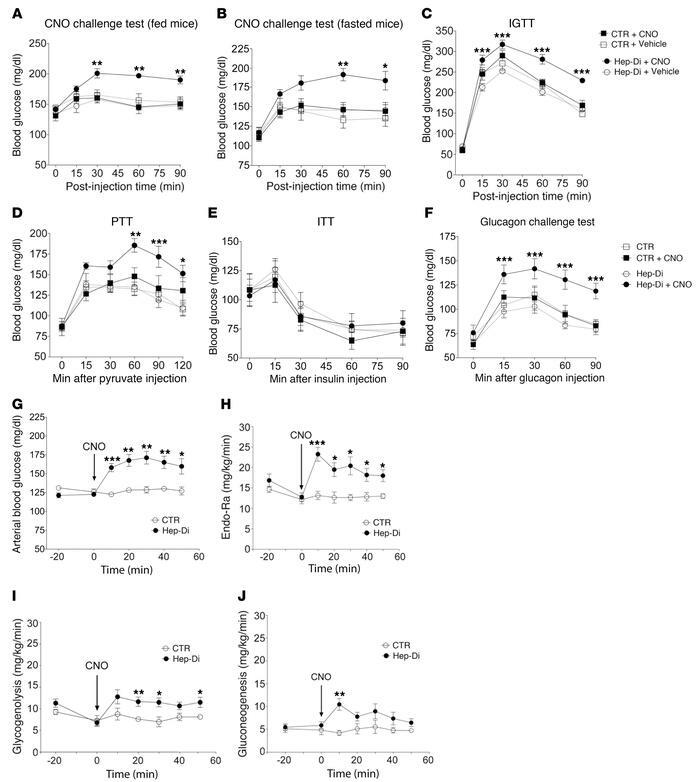 (G–J) Effect of CNO on hepatic glucose fluxes in conscious Hep-Di mice in vivo. (G) Changes in arterial blood glucose levels and rates of (H) glucose appearance (endogenous glucose production [Endo-Ra]), (I) hepatic glycogenolysis, and (J) gluconeogenesis following CNO (10 mg/kg i.v.) treatment of Hep-Di and control mice. All experiments were carried out with chronically catheterized, conscious mice, as described in detail in Methods. After a 5-hour fast, mice were injected with CNO (10 mg/kg) at t0. Mice were maintained on regular chow. All studies were performed using 11- to 16-week-old male mice. Data represent the mean ± SEM (n = 6–8 mice/group). *P < 0.05, **P < 0.01, and ***P < 0.001 versus the corresponding control value. Significance was determined by (A–F) 2-way ANOVA followed by Bonferroni’s post-hoc test and (G–J) 2-tailed Student’s t test.